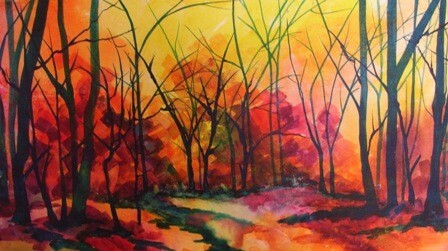 Out of all the seasons, I think Autumn Landscape Paintings are the most popular. To be honest, I find this very understandable. The season of Autumn showers so much extra colour and texture on your senses. Also I love the contrast between the rich, bright colours with the emerging stark silhouette of tree trunks and branches. How to choose which scene to paint . . . If you are like me or many artists, as you look through your photos and sketches, there is an extensive collection of autumn scenes. Choosing which one to do an Autumn Landscape Painting from is an important decision to get right. 1. Do you want to focus mainly on the rich autumn colours? 2. Is your focus the fallen leaves creating an exciting textural carpet? 3. Are you attracted to the silhouettes of the bare branches? 4. How will you get the viewers' eyes to travel around the painting . . . Pathways or streams can work effectively. 5. Consider using complementary colours to bring your painting alive. So with the autumn shades of yellows, oranges and browns, add in some splashes of turquoise or shocking pink. 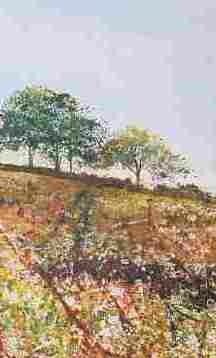 Another approach to Autumn Landscapes is to consider autumn fields. Why not go for a drive, take some photos, do some sketching? Make notes of the colours, but also absorb the atmosphere. Is there a chill in the air? A stillness descending? When I took the photographs for Barton Down (as seen above) a rainstorm was approaching, and the atmosphere was quite 'close'. I aimed to capture this intensity in the painting. The field furrows lead to the horizon and it is left to the viewer to imagine what is beyond . . .